We received some beautiful, fresh tomatillos in our foodshare this last week, and decided to whip up a quick salsa out of them. Tomatillos are a mainstay in Mexican and Latin American cooking. Chances are, if you’ve ever had a green salsa or sauce at a Mexican restaurant, then you’ve had tomatillos. They are part of the nightshade family (same family as tomatoes, potatoes, peppers, and gooseberries), and are usually bright green in colour, although there are tomatillos that are a green-purple. They have a firm texture, tart flavour, and grow with a paper-like covering over the fruit. Needless to say, we were really excited to get them and to make our own version of the tart salsa. The great part is that this salsa is really simple, quick, and easy – perfect to whip up for an appetizer or snack. To start with, remove the papery coverings from the tomatillos and rinse the sticky substance from the tomatillos. 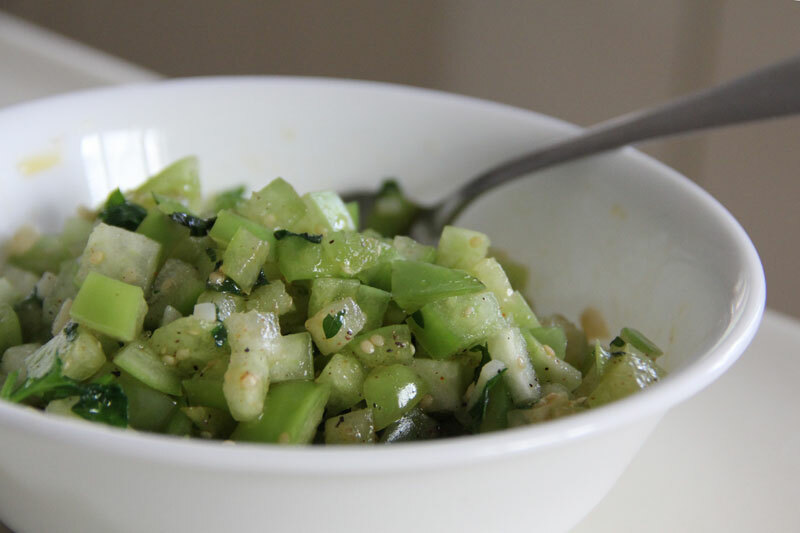 Chop the tomatillos into small chunks and place in a bowl. The size of the chunks is completely up to you. I like mine relatively small, but not fine. Next finely chop the garlic, chili pepper and cilantro (or parsley). If you like the heat, leave the seeds in. If you don’t want your salsa to be as spicy, deseed the pepper first before chopping it by slicing it lengthwise and scraping out the seeds. 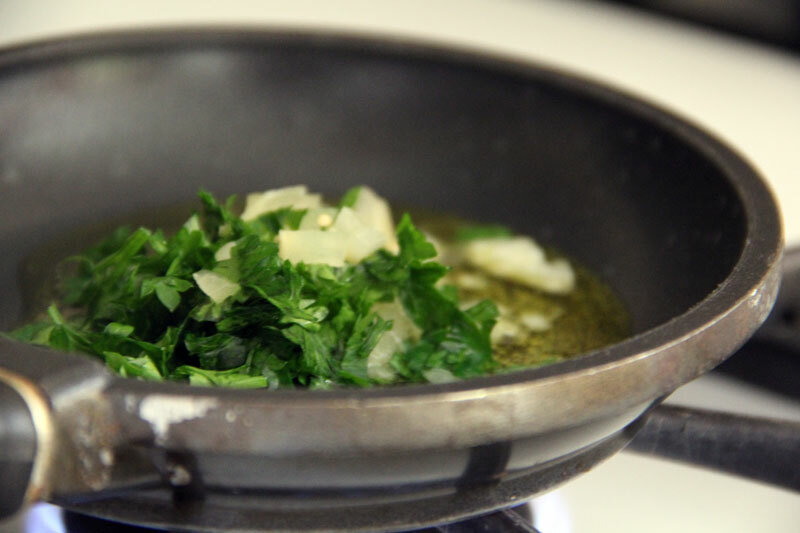 Heat up the olive oil in a small saucepan, and throw in the chopped garlic, chili and a third to half of the cilantro. Give the garlic, chili and cilantro a stir so they get even heat. Once they have had a chance to sauté for a few minutes, add about 1/3 of the chopped tomatillos and stir. Let the contents of your pan sauté further for another few minutes – enough for the garlic to become aromatic and softer, but not so much that the tomatillo chunks get cooked through. Instead, they should just soften slightly, but not much. 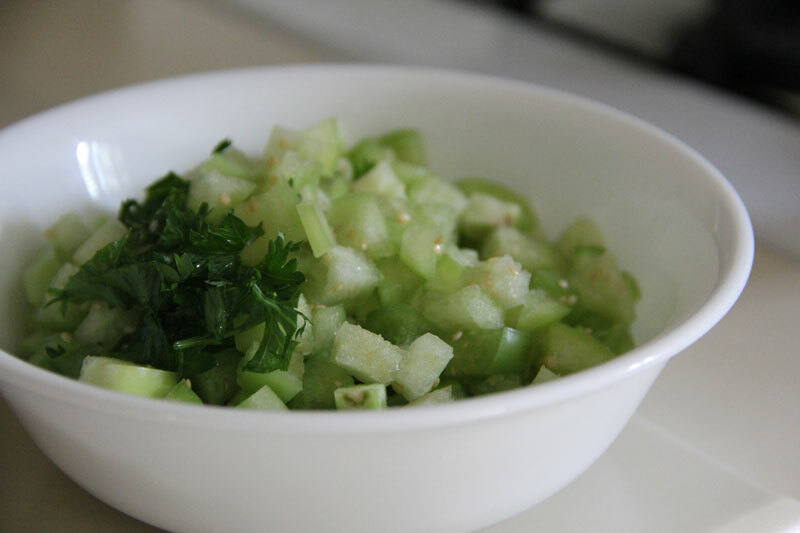 Pour the cooked garlic, chili, cilantro, and tomatillo over into the bowl of uncooked tomatillo and cilantro, add the lemon juice, salt, and pepper to taste and mix well. Voilà! All set. You’re ready to serve – just add chips. This entry was posted in Sides, Starters, Vegan, Vegetarian and tagged Mexican, salsa, tomatillo. Bookmark the permalink.